Liverpool got back to winning ways with a resilient 1-0 win against Brighton at the weekend, putting them seven points clear at the top of the Premier League ahead of Manchester City's game against Wolves on Monday night. Key to their victory was the defensive discipline of Fabinho and Virgil Van Dijk, the former of whom was drafted in at centre-back following an injury crisis for Jurgen Klopp. A decision that certainly paid off, with the Brazilian utilising his experience to stifle the home team's advances, the 25-year-old has earned rave reviews since. When clubs make signings it usually goes one of two ways; the manager either immediately puts them into the team, hoping they will make an instant impact, or a plan of adaption and adjustment will be put in place to allow new recruits time to bed into their new surroundings and get used to the philosophy. Jurgen Klopp has often tended for the latter, showing patience with his new players. Take Oxlade-Chamberlain for example; the former-Arsenal midfielder arrived in the summer of 2017 but didn't make his first start for Liverpool until September's 2-0 League Cup defeat against Leicester City. His first Premier League start came three months further down the line against Bournemouth, reflecting the slow model of adaption Klopp had installed. Andy Robertson's Liverpool career took a similar pattern too, with an inital understudy role to Alberto Moreno restricting him to just two appearances by the start of December. In fact, it took a fortuitous injury to the Spaniard that granted the left-back his opportunity - a chance he's never looked back from. Thus, Klopp's pattern of adaption has borne fruit on several occasions, with a similar strategy appearing to bring the best out of Fabinho following his arrival in the summer. "Me and Chambo experienced it last season. Naby is experiencing a wee bit now, Fabinho has experienced it, Shaq has experienced it," Robertson reflected. "It's just learning and of course the massive expectations that come with playing for Liverpool sometimes take a wee bit of getting used to. It did for me and once I got used to it I've not really looked back. Fabinho took his time and now we are getting the rewards from it." Despite making major improvements in the club's overall depth, options remain pretty thin on the ground in defence for Jurgen Klopp, with injuries to Joel Matip and Joe Gomez and the January departure of Nathaniel Clyne leaving the weight of Liverpool's title bid on Trent, Lovren, Van Dijk and Robertson. Matters were only made worse when Dejan Lovren sustained a hamstring injury in the FA Cup third round, leaving the manager scratching his head at potential defensive options in the midst of a crucial run of domestic and Champions League games. 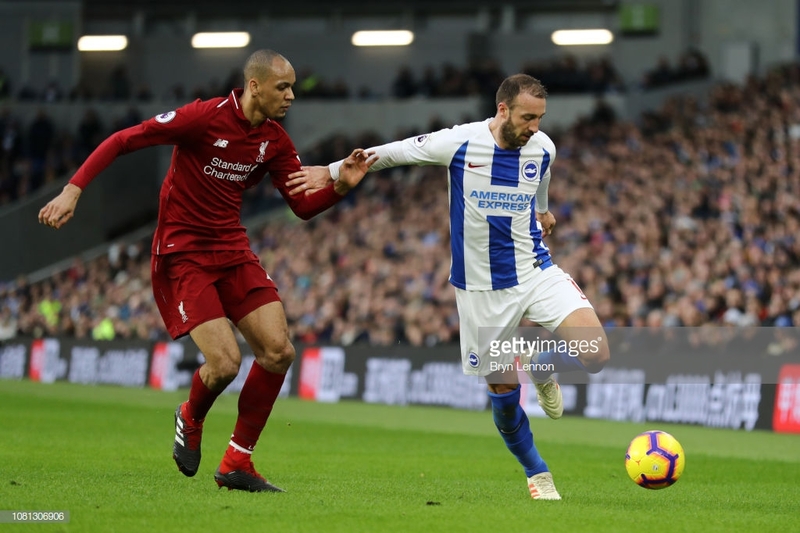 Shoe-horned in at centre-back against Brighton, the Brazilian delivered a strong performance alongside Virgil van Dijk, reading the play well and showing positional intelligence to snuff out the danger. Indeed, Fabinho was considered man of the match by several Liverpool fans such was the quality of his display. It wasn't just the fans who were impressed either, with teammate Andy Robertson praising the 25-year-old. "For somebody playing out of position, he covered so well, he cleared away and had so many good blocks," the Scotsman said. "So credit to him because it can't have been easy for him playing out of position. I'm sure Fabinho would have preferred to play as the No.6 but that's the attitude we have in the squad. We are all willing to play in different positions if we have to." "I'm sure the manager just told him early doors and he embraced it and I thought he was brilliant. I thought he was different class." Despite being the target of unwarranted criticism during the early days of his career on Merseyside, the £40million man has certainly come into his own in recent months, with his clear versatility the latest indication of what a valuable asset he's become for Klopp's side.